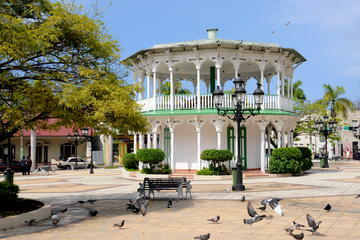 Out of all the Puerto Plata excursions and we took, the half day city tour was both educational and fun. We started at the Tropical hotel, part of the Lifestyle Holidays Vacation Club and rode in an air-conditioned Caravan to each stop. If you’re visiting Puerto Plata solo, with family, on a baecation or have need ideas for Puerto Plata shore excursions, read more about things to do in Puerto Plata. The first activity on our Puerto Plata excursion was to the Puerto Plata cable car up to Mount Isabel de Torres. It was a 5-7 min trip going up and down and a bit scary for me as I am not too fond of heights. As we reached the top, we learned about early settlements, the mountain’s history and took pictures with a mini Christ the Redeemer Statue. We also saw beautiful views overlooking the city and countryside of Puerto Plata. Stop number two was the Brugal Rum factory. The guide gave us a history of the Brugal company and the amount of rum produced and distributed. A plus for this tour was tasting and purchasing the different rum flavors, but it wasn’t as interactive as the Bacardi Rum Factory. Since we visited Puerto Plata during their Independence month, it was fitting to visit Independence Park and the Catholic church. The square was decorated nicely preparing everyone for the children’s carnival that was being celebrated that week. The church was absolutely BEAUTIFUL. There were mahogany chairs and marble floors. We were informed that the church was recently remodeled after an earthquake some years ago. After the church, we went to a local souvenir shop to see the cigar making process and purchase gifts. Fort San Filipe was one of the first forts to be built in the Americas. As with most forts, its purpose was to prevent pirates from entering the north coast of the island. The fort was huge and we were able to see where the new cruise ship port was being built as well as catch a breeze from the Caribbean Sea. What are some of your favorite Day trips in Puerto Plata?